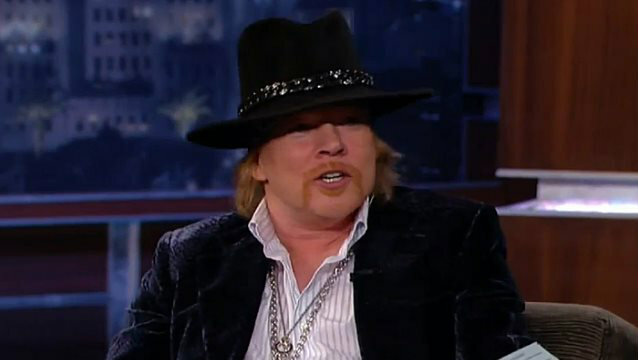 According to The Pulse Of Radio, in a new piece at New York magazine's Vulture site, titled "What Happened When Axl Rose Rented My Apartment," writer Steve Fishman describes how the eccentric GUNS N' ROSES singer was looking for a New York pad around three years ago and found Fishman's place, which was located in the downtown TriBeCa area and which Fishman was making available for rent. Fishman said that Rose came to see the 5,300-square-foot place twice, saying he was looking for an apartment without a lot of "glaring" sunlight. Fishman's wife reported that the one time she was there when he visited, Rose "played enthusiastically with our dog" and "loved the place." Fishman was worried because Rose had a reputation for wrecking places, but the singer agreed to pay a high rent and left a six-month deposit. When move-in day arrived, however, Axl didn't. By the time his one-year lease was up for renewal, he had not set foot in the apartment again — despite continuing to pay the rent. His assistants claimed he was still going to move in, but although he had even been in New York and stayed at an expensive hotel, he did not spend any time in the apartment. Nevertheless, Axl renewed for a second year at an increased rent — but even though the rent checks kept coming, he never went back to the apartment. His management finally called the whole thing off when it was time to renew for a third year. Fishman concluded, "People have mixed views of Axl Rose, but as a landlord, I loved him. If he ever needs a recommendation, I’ll happily write: Quiet, undemanding, and pays his rent."